'Run the World (Girls)' by Beyonce was blasted in support of Rep. Alexandria Ocasio-Cortez. Multnomah County's Board of Commissioners staged an impromptu shindig on Friday, Jan. 4, blasting the Beyoncé tune that poses the question: "Who run the world?" Or, in this case, the all-female board of elected officials in Multnomah County. "Sometimes dance is what happens when women lead!" said Commissioner Jessica Vega Pederson, who can be seen groovin' with some of the county's civil employees. 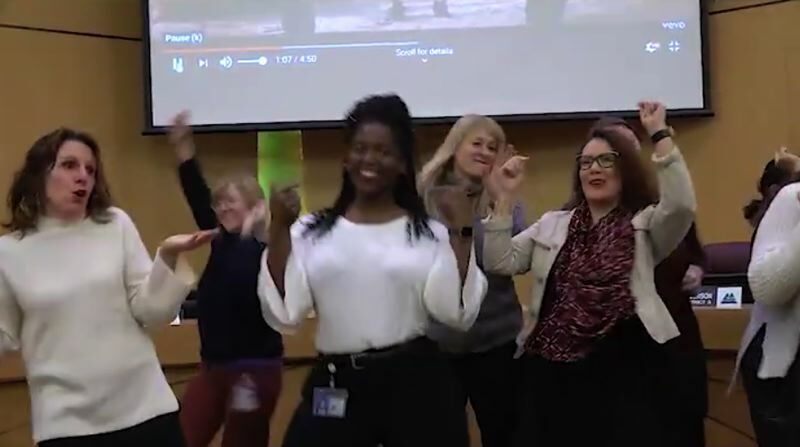 Also featured: County Chair Deborah Kafoury, spotted raising the roof, and Commissioner Lori Stegmann, who rocks out as well during the seven-second clip. "From our @multco board room to the halls of Congress!" Stegmann tweeted later. The dance party was staged in support of U.S. Rep. Alexandria Ocasio-Cortez of New York, who has become an infatuation for liberals across the country. Footloose footage of Ocasio-Cortez dancing during her college years surfaced on the internet recently, but the apparent attempt to embarrass her backfired. Madrigal wrote: "Women in @multco gov dance too!!! #WaitTilTheyFindOut #scandalous #runtheworld #boss"
Check out the footage of the dancing here.